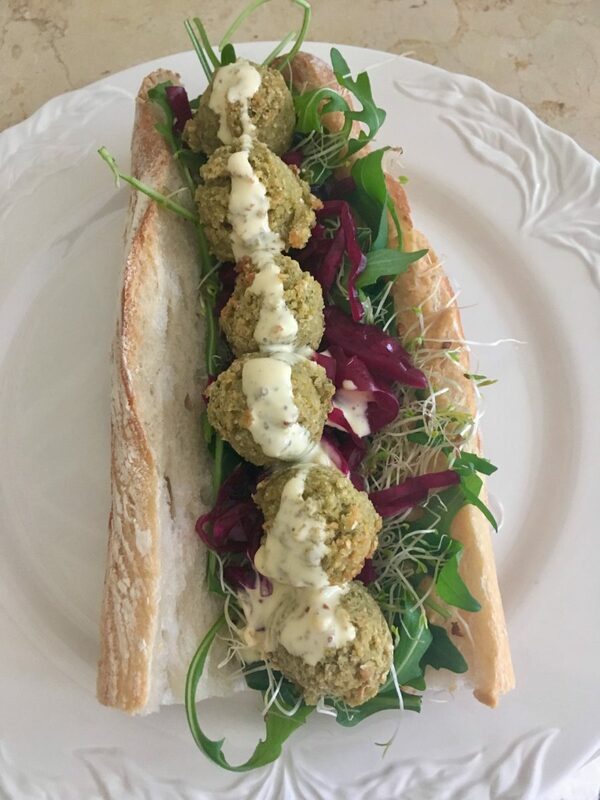 Ever since we enjoyed falafel at l’As du Fallafel on rue des Rosiers on our trip to Le Marais last year, I’ve had a bit of a thing for them. I typically buy them from my local Bio Marché but they’re quite pricey, so I decided to have a go at making my own though a baked in the oven (rather than fried) version. Who knew it was so easy? 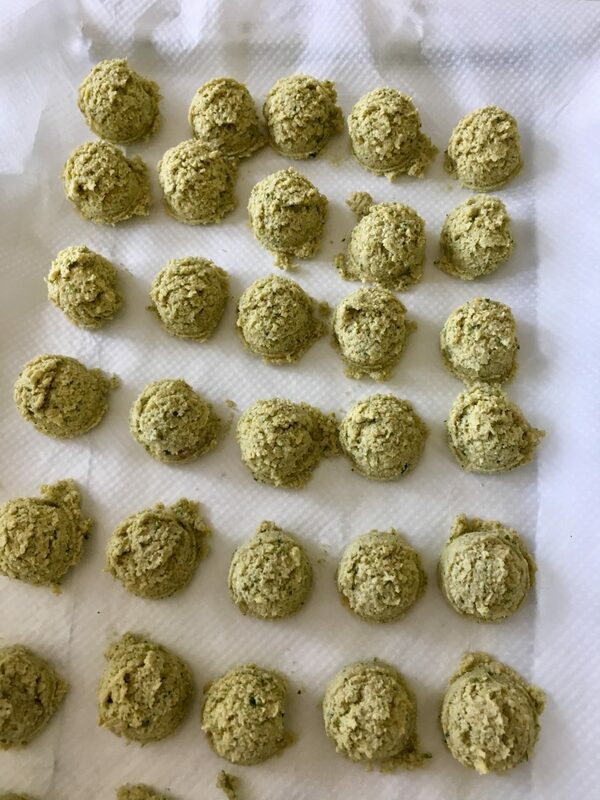 I soaked the dried chickpeas overnight, then tipped them into my food processor with my choice of herbs and spices, rested the mixture in the fridge, shaped it into balls (with my handy dandy, super small, ice-cream scoop), baked them in the oven and voilà. And, just out of interest, I made approx. 70 (organic) balls for a cost of € 5,00 – way cheaper than those from the shop. 1. 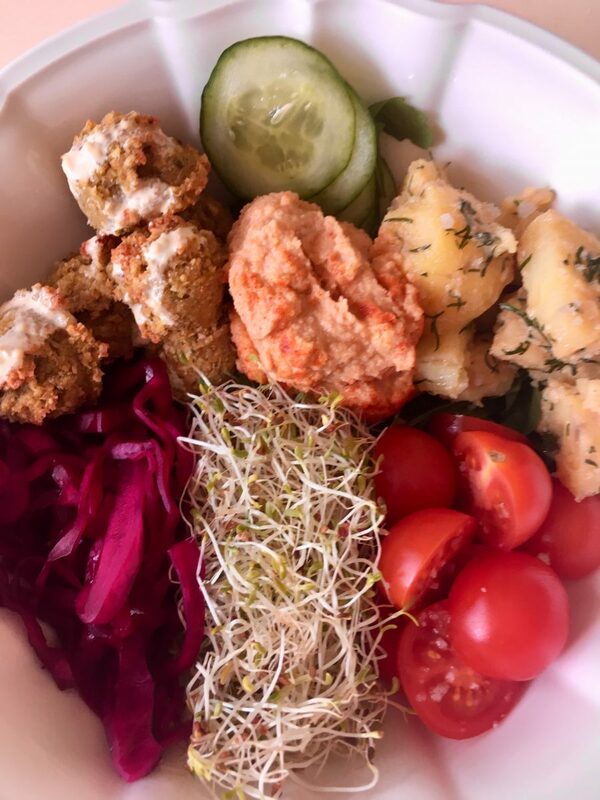 The day before you want to eat the falafel, put the dried chickpeas into a large bowl and cover them with filtered water by an extra 5 cm (2″). 2. 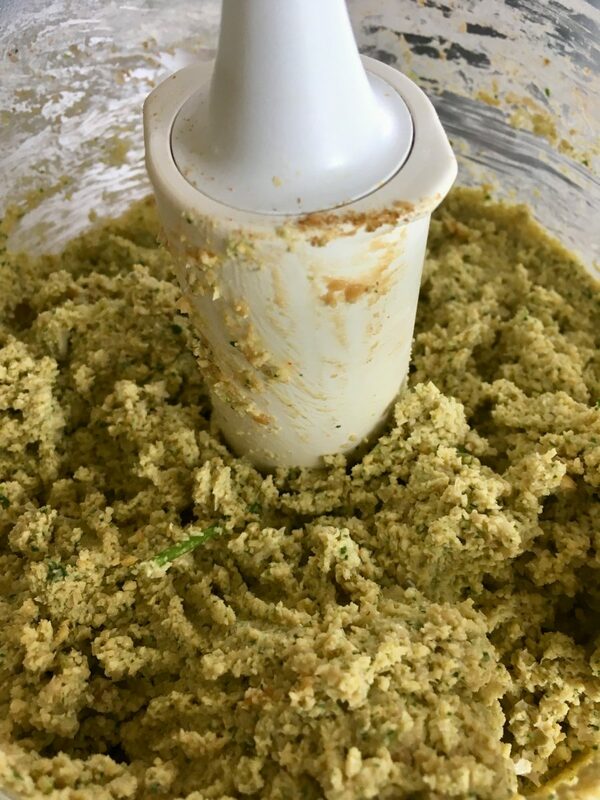 The following day, rinse, drain and put 4 cups of the chickpeas into the bowl of a food processor with all the other ingredients. 3. Pulse to process, scraping down the sides of the bowl as needed, and continue pulsing until the mixture comes together. I almost puree the mixture but, if you prefer, leave it relatively chunky. 4. Put the mixture into another bowl or container, cover and refrigerate for at least 1 hour. Refrigerating also helps the mixture firm up and become less crumbly when baked. 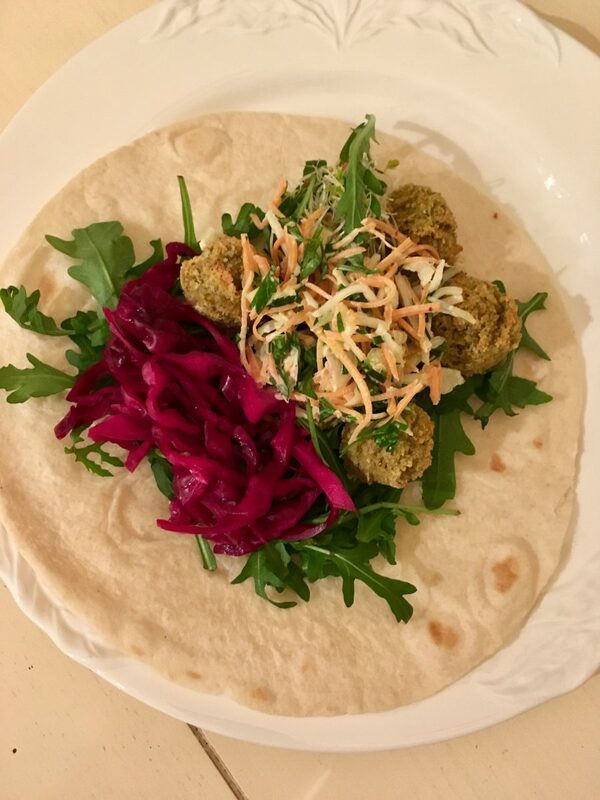 You can then bake the falafel right away or refrigerate the mixture for up to five days. 5. Preheat oven to 180ºC/160ºC fan/gas mark 4 (350ºF/320ºF fan) and line a baking sheet with greaseproof paper. 6. 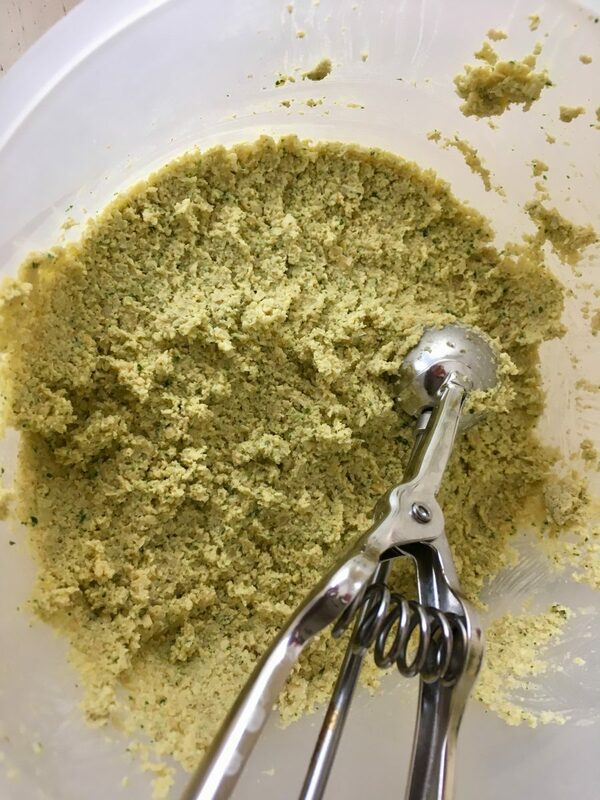 Use a small scoop or teaspoon to shape the falafel mixture into balls, and place them on the sheet. Don’t smooth out the rough edges as these crisp up when baking. 7. Put in the oven and bake for 18 to 20 minutes until they have a golden and crispy exterior, feel dry to the touch but still give a little when you press them. 8. Eat warm or at room temperature, or store for up to five days in the fridge. Reheat cooked falafel for 30 seconds in the microwave before serving. 1. 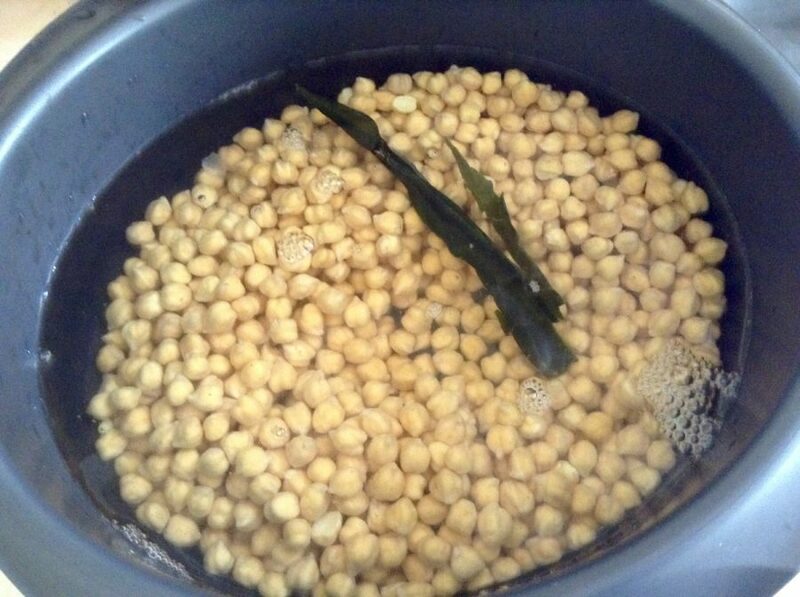 Because the chick peas are only soaked not cooked, ensure that they’re reasonably fresh. This is not the time to use ones past their “use before” date! Also, don’t use tinned chick peas! 2. Experiment with the mix of herbs and spicing. For example, if you don’t like coriander, use flat leaf parsley instead. 3. 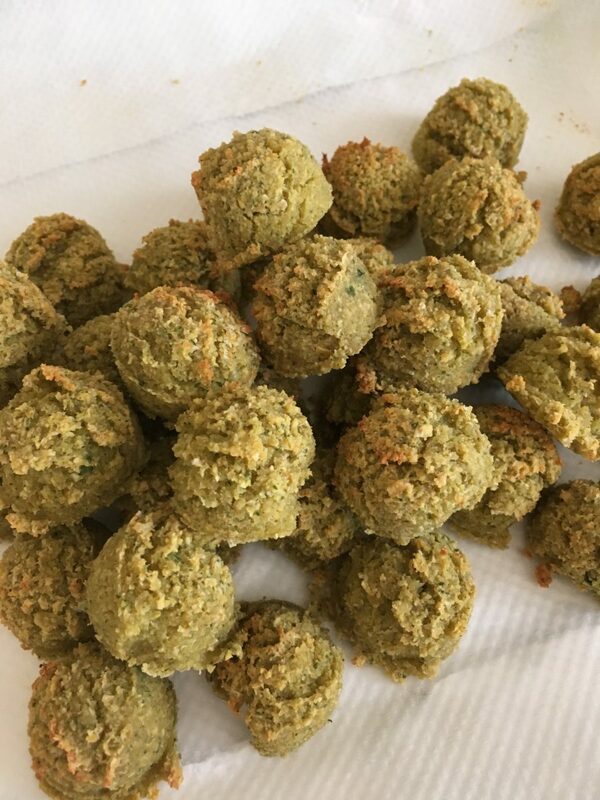 Once baked and cooled, the falafel can be frozen and kept for at least a month. Once defrosted, you can quickly reheat them again. 4. The L’As du Fallafel serves them in pitta pockets, which are huge. Hard to get your mitts around, let alone your mouth. They also serve them as part of a falafel plate. I prefer to serve them warm in a wrap with coleslaw, pickled vegetables, hummus and/or a tahini sauce or serve them at room temperature as part of a salad. Equally, they’re delicious piled into a baguette with plenty of trimmings. Wonder if eggs would work instead of flour, which I’m avoiding. No! But I think you could probably make them without flour and reduce the amount of olive oil..
Oh this is fantastic. 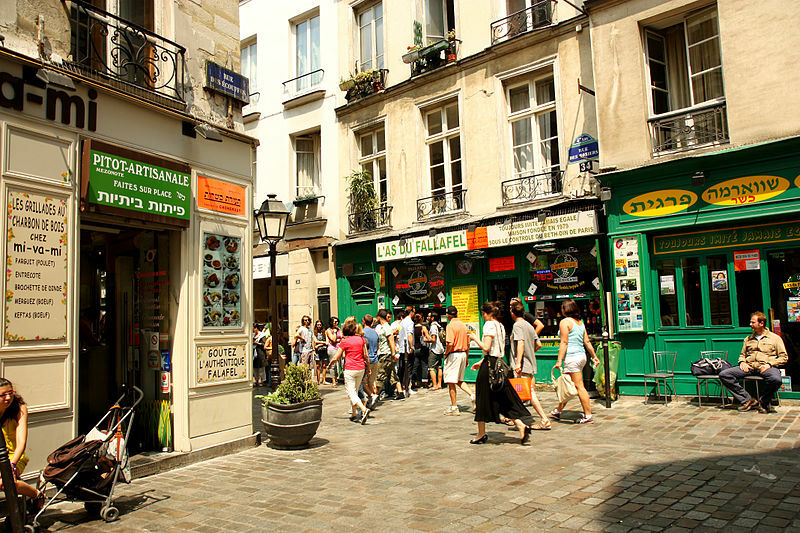 I’ve been missing those falafel we’ve had at the Marais. Thanks for the recipe. I will definitely give it a try! The ones in the Marais are deep fried rather than baked in the oven. I was aiming for a “healthier” version. I prefer that too. Thank you! I love falafels! Not many places around here that make them. Will have to try this recipe. Thanks! Falafels are my absolute favorite! I grew up in Dubai, and living in the US now I am always craving falafels!